Published: November 28, 2012 | This entry was posted in North American New Right and tagged Abraham Lincoln, Daniel Day Lewis, Gregory Hood, Lincoln, movie reviews, North American New Right, Steven Spielberg, the Civil War, white dispossession. Both comments and trackbacks are currently closed. Aha! “Lincoln” is a sort of remake of “Schindler’s List”, with Old Abe as Schindler, and the Darling Darkies as proxies for the poor oppressed Jews. The review indicates that the entire film is a revelation on the way Jews regard the White Goy. 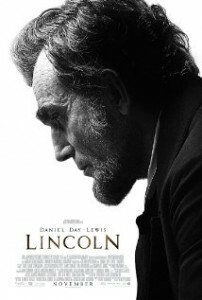 Speilberg – Jew – and Kushner – Jew- cast a Jew – Daniel Day Lewis – and Jew Joseph Gordon Levitt, as Lincoln’s son, as Moral Light Unto the World types, who cheat, lie, and murder to achive thier Lofty Moral Goals. Well sounds like the good news is that its a long boring flick that would only appeal to the older self hating white audience and not a crossover audience or young at risk audiences. The majority of Negroes certainly would not make it through a flick like this. And more importantly, I don’t see the K-24 white audience having the interest or attention span to make it through this type of brainwashing experience. They’ll watch the vampire killer version instead. So yes these tools spent a lot of time, money and resources making an anti-white film that is only going to wind up preaching to the choir. Little harm done, I can’t see how that audience could be any more motivated to destroy anything white and normal than they already are. And by the sound of it, this may end up becoming a camp favorite for race realists. I’ll have to steal a copy just so I can enjoy the horrified reaction shots of blackie in the balcony as the white men debate their fate. In fact maybe someone can grab scenes from this movie, Roots and Amistad and create a “ship them negroes back” short film, complete with laugh track. Thanks, so I’ll rather watch “Birth of a Nation” again… which is almost a hundred years old by now, and seems subtle in comparison. Like Sci-Fi-movies, historical movies are always about the present, not the past. Thanks. I’ll look for Vampire Hunter instead. At least it leaves the South a bit of dignity: instead of being failed human beings they are just monsters. And it works. It really has a deep psychological effect on the masses, especially children and preteenagers. I have never been disappointed by a single piece I’ve read from Gregory Hood. He’s a very deep thinker, close to William Pierce in caliber, so there’s not much thing to add to his articles. Keep up the good work! The US Senate adopted the resolution containing the text of the amendment on 4/8/64. The US House adopted the resolution on 1/31/1865. It wasn’t until the post-war government of Georgia ratified the amendment on 12/6/1865, almost eight months after Lincoln died, that the Secretary of State declared the amendment ratified as part of the US Constitution. Thanks for the review. I can’t say I expected it to be an honest portrayal. I won’t pay to go see it in theaters, but I’ll download it eventually. I used to live not far from Thaddeus Stevens’ grave. He absolutely was a radical, and the people of our bygone America knew it. Few among the common populace actually believed in true natural equality of all people or cultures or anything else for that matter. Today’s America is basically what you get when the “Radical Republicans” become the norm with an added jolt of Marxism for good measure. It’s a real witches’ brew. Additionally, I have noticed on several occasions that liberals attempt to justify Lincoln’s anti-egalitarian statements and speeches with arguments that he was simply trying to get the public to accept little bits at a time. Doing otherwise (saying Blacks were to become equals in every way, intermarry, etc) would have doomed emancipation. The “moral compass” scene seems to be another reiteration on this theme. The basic idea being that Lincoln was not only “just like us modern liberals” but also a very shrewd and capable politician. What are your thoughts on that? I doubt Lincoln would have been busy making colonization plans even after the Emancipation Proclamation if this were true.